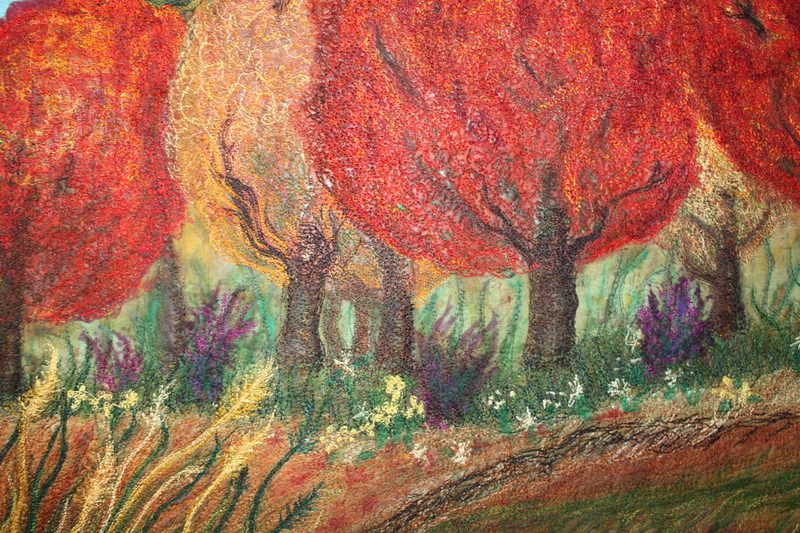 I’m a bit obsessive about making my fiber art, it can cause me to be a tad unobservant of what’s happening around me. In spite of the fact that I’m a rather concentrated but unobservant fiber artist, I did manage to observe something the other day. It was a commercial for school clothes. School clothes. Didn’t summer just start? Apparently not, according to the TV commercials it’s time to start thinking about school clothes. Fall will be upon us in no time and with it, change. 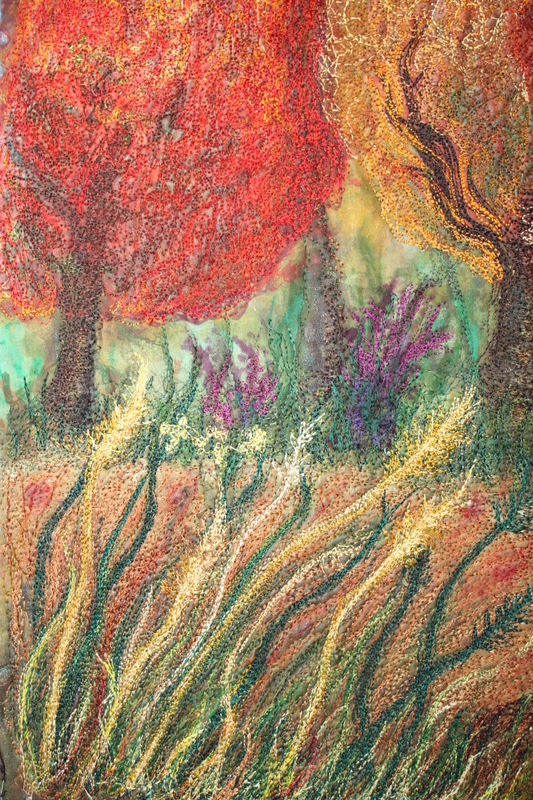 That is the theme behind my latest landscape art quilt, “Change, New Beginnings”. Change is inevitable. I have to admit I can be slow to adjust at times. Rather than resist it, I’m trying think of it as an opportunity. We’ve been given a fresh start, of sorts. “I didn’t get to that last fall, but this year I’m going to….”. The great thing is that the slate is clean, we can do whatever things that nagged away at us the past year. This new season offers an opportunity for change. It’s a good time for it. My advise to all, including myself is, use it wisely, because time really does fly! I love the feeling of satisfaction when I’ve completed an art quilt and like the results. And I love the anticipation of starting the next one. I guess I’m just a person who loves beginnings and endings. 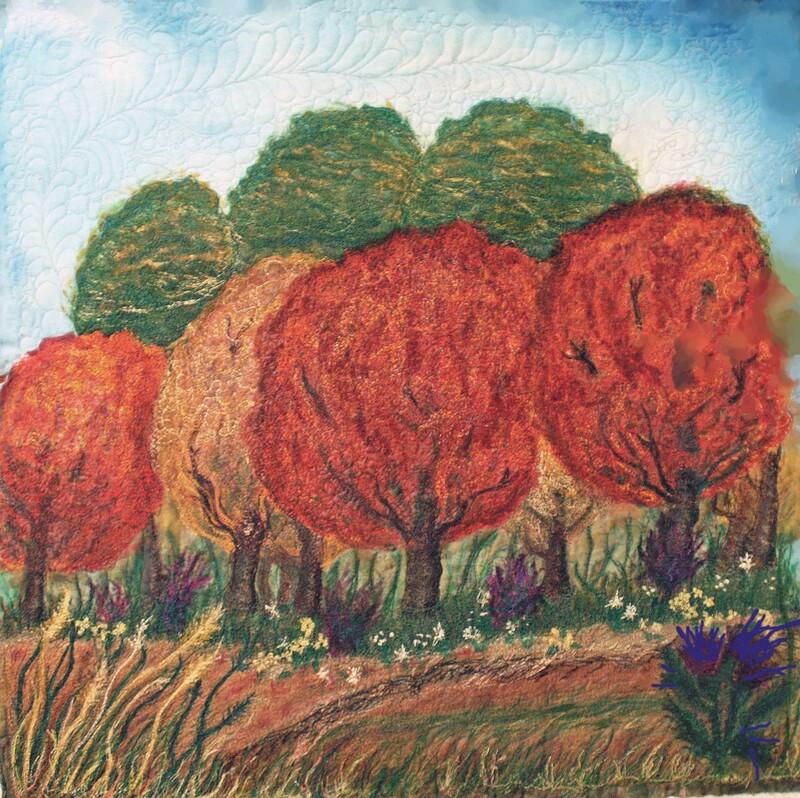 Here’s that landscape art quilt; “Change, New Beginnings”. with the growth of a new season. I haven’t had even one bad experience, which is strange because I require a great, great deal of patience to help. I have not sensed one single sign of irritation, no impatience or exasperation detectable in their voices. Nada. Just nice polite and patient people with a desire to help you. One more change, I’m going e-commerce. Which means for anyone unacquainted with the term [I feel it’s important to explain terms, I appreciate it when others do that for me. Just kidding, you all know what eCommerce is.] I’ll have a store right on my site, with the ability to purchase my work directly from there. Big change for me, you may have already heard about this. I might have mentioned it, oh just a few times perhaps. Stage one completed, the store and tie in to this blog is in progress. So just to take a look at the bare bones of it http://BarbaraHarmsFiberArt.com. I’m slow, but eventually I’ll get the store up. Categories: Archeives, Blog posts, Nature Quilts, Older Posts-, Recent Posts, Uncategorized, Uncategorized., What"s New?